Here is a great lunch that includes sprouts, so easy to throw on whatever you like. I had 1/2 cup of brown rice left over, warmed that up and placed into a bowl. I warmed up Lemon Tahini dip, mixed it with some chickpeas and added that to the rice bowl (can’t see them in the picture but they are under the veggies). 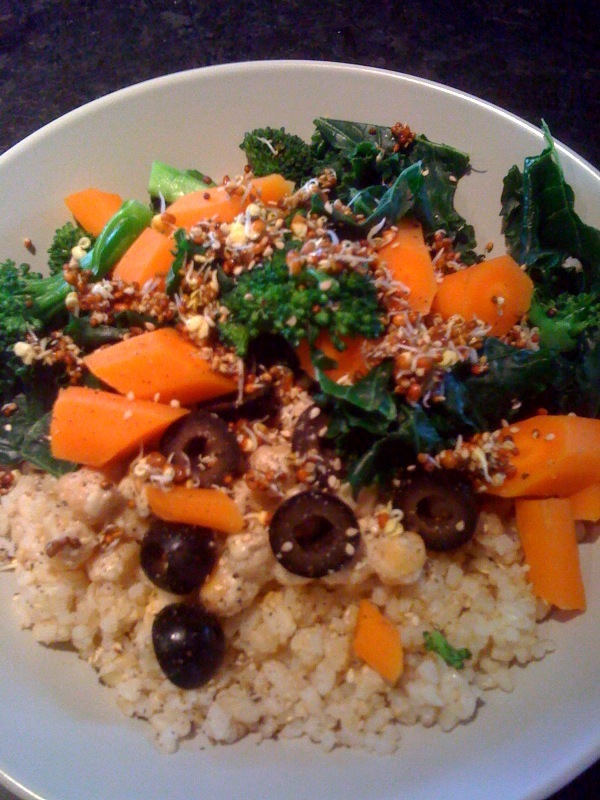 Over the stove I steamed carrots, broccoli and curly kale and added that to the bowl. Sliced up a few black olives and sprinkled the whole thing with sprouts (those are the Spring Salad Mix), sesame seeds and fresh ground pepper. You could give the bowl a squeeze of lemon if you’d like and Voila! Healthful lunch on the fly.